Hidden Founders has figured out how to connect non-technical Founders with technical Founders. What do you do if you have a great idea for a tech startup, but no technical knowledge about how to build it? Well, there are usually three options: find a technical Co-Founder you can work with, outsource to an expensive dev shop in the States or in Europe, or outsource to a cheaper (but often lower quality) dev shop overseas. Hicham Amine and his company Hidden Founders are out to add a fourth — and better — option to that paradigm. Hicham describes Hidden Founders as “halfway between an incubator and a dev shop.” Dev shops, for example, traditionally complete the technical specifications of a project — and then leave. They have no investment in the company and, usually, are more like hired hands than members of the team. Incubators, on the other hand, typically take equity. In return, they invest a huge chunk of time and energy into the success of a startup. Founders go through intense courses lasting anywhere from three to nine months, a time period that’s capped off by a “demo day” presentation in front of potential investors. It’s like Startup College, but instead of paying for your lessons, you’re getting paid in the form of investment. We help them build their products and rapidly get them to the market to test their hypotheses at a minimum cost, while meeting advanced standards of quality. Hidden Founders combine the two — dev shop and incubator — to create their own, new solution to the “where the @$^! @ can I find a technical Co-Founder?” problem. Like an incubator, they not only take a 3 percent equity in every company they work with, but they also are strict about which companies they take on — wantrepreneurs need not apply. So far, they’ve worked with two cohorts of 20 startups, which were chosen from an applicant pool of over 200 companies globally. During the time that Hidden Founders is building the product, they also work to find technical Co-Founders who are a good fit for their companies, both in terms of skills needed and vision. Companies that are accepted by Hidden Founders sign up for an initial six month contract, after which they’re free to choose whether or not they want to continue with the program. The entire project cycle from fledgling startup to becoming an independent company is 18 months, with products getting to MVP level within four to six months. Oh, and they’re currently accepting applications, although this round closes on January 1. In addition to building the product and finding companies a solid technical Founder, Hidden Founders also connects their clients with a network of mentors and entrepreneurs who can help them in their journey — similar to what an incubator does. They’re also creating a startup continuing education program for both their partners and anyone else who’s interested. 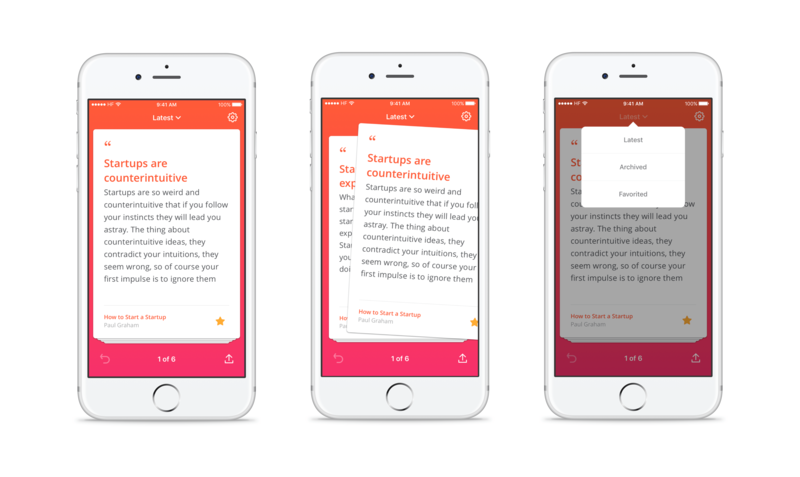 Startup Patterns is an app that provides bite-sized lessons from the best startup blogs, books, and experts, delivered to you three times a week. The goal is to not only foster continuing education for startup founders but to also cultivate a community of Founders, experts, and investors who are looking not only to learn but to connect with each other. A lot of people have amazing ideas, but an idea is just an idea unless you have someone to help you turn it into a reality. Hidden Founders has figured out how to not only bridge that gap between technical and non-technical Founders, but also supports early stage startups at a time that they’re most vulnerable to failure. Isn’t it great to have a fourth option?